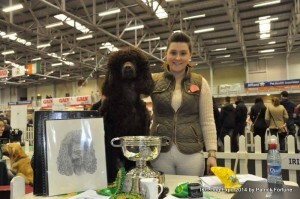 At the St Patricks day Irish kennel Club Dog Expose we had great success at our breed stand. Lots of lovely people interested in the IWS and Willow charmed the crowd. On Saturday at the Celtic winners show Willow (aka Azariel Come O’er The Sea) won Best Of Breed and Group 3. 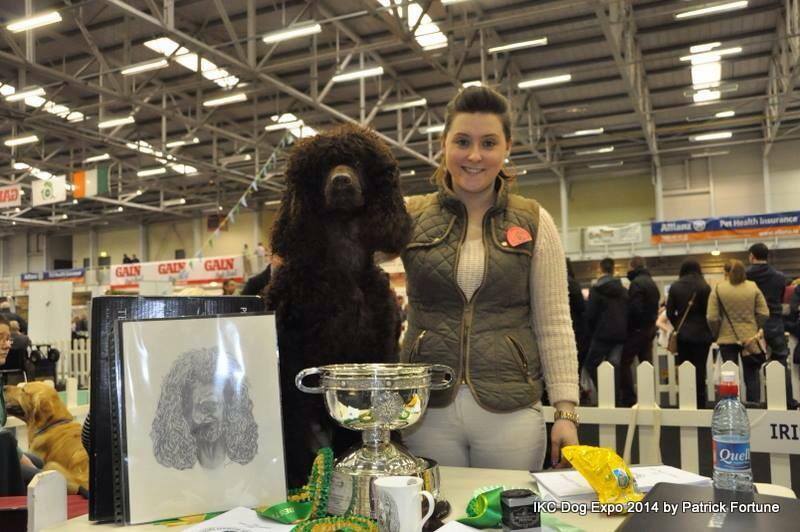 She also was placed 4th in Best Native Irish Breeds Final! Well and truly flying the flag for the breed both in and out if the ring this weekend. Congratulations to our very own Club Committee member Emma O’Donnell on this great achievement. We hope there’s lots more to come. UncategorizedComment on Great weekend for the breed again! So, the committee have just finished their first meeting of 2014 and we’re proposing to run a fun day for Irish Water Spaniel owners and the general public on the 11th of May. At the moment the venue is tentatively set as Dromin, Co. Louth and we’re posting this to give as much notice as possible but also to seek feedback on what you’d like to see on the day. If you’ve got an idea that would help make the day a success please post a reply here or email committee@iwsc.ie, we really would like to get ideas from members so we can host a great event and kick off the year with a long overdue day that everyone can enjoy. The first confirmed event for the day is a free grooming lesson from Emma O’Donnell. Emma will be doing a live demonstration on the day to show owners (and anyone considering the breed) how to groom an IWS. It promises to be a great opportunity for IWS owners all over Ireland to meet up, have some fun, meet the committee and give their dogs a great day out. We hope you can join us on the day. Please check back here for further updates and confirmation of the date and venue which we’ll post as soon as the final decision is made. After a somewhat difficult year for the Irish Water Spaniel Club, the committee is determined to get it back on its feet but we need your support, we are looking forward to seeing everyone again at the AGM. The Daily Mail – January 17th 1927! Thanks to our very own Pica Harvey Kelly we have a copy of The Daily Mail from January 17th, 1927 which not only mentions the Irish Water Spaniel but has a photo of one for the article titled Do Dogs Reason? Reads the caption that accompanied the photo. The article, which is sub-titled Why a Puppy is More Intelligent than a Child of the Same Age, appeared all of 85 years ago and has been stored safely by an IWS lover ever since. Stay tuned as we hope to bring a you the article in full. Newspaper articles , Uncategorized1 Comment on The Daily Mail – January 17th 1927! Club Gathering / Fun Day – ideas? We are hoping to organise a fun day for all members in the coming months. If you have any ideas about an event which you would like the club to hold, please sent them to committee@iwsc.ie. All suggestions are very welcome. EventsComment on Club Gathering / Fun Day – ideas? Due to unforeseen circumstances beyond our control, we have been delayed in collating our newsletter this year. If you would like to submit an article please contact us using the form below, the deadline for this is March 1st. This is a great opportunity for you to voice your opinion and thoughts on the breed or perhaps share some interesting stories about life with an Irish Water Spaniel and help spread the word about about our historic breed. We would really appreciate articles on the following subjects for the benefit of new members to the club. If you would like to place an advert for your Irish Water Spaniel, the suggested donation is €15 / £13 for the first page and €10 / £8 for subsequent pages. Please include a photo of your dog and their age, name and pedigree. These adverts will also be appearing on our website later in the year. You do not need to be a breeder or own a top show or field trial dog to contribute. If you have unfortunately lost a dog since the last publication, the format is similar to the advertisement page and will be published for free. Please send all articles and advertisements to the honorary secretary (these will be returned to you with your copy of the newsletter) or if you have any questions please do not hesitate to contact the Secretary.